Your weapon of lash seduction! Its mission: KILLER VOLUME. FLIRTACIOUS LASHES. Its innovation: 500 bristle mega brush with ultra-fine and supple bristles coat every single lash for maximum volume. PLUS, its special brush tip contains lash micro-captors to reach even the smallest of lashes. Its formula is enriched with volume-boosting agents and black pearl extract (Whhaaaatt??? ) for fully coated intense black, luminous lashes that for up to 16 hours**. And…it’s good for my eyes! Suitable for sensitive eyes and contact lens wearers. Its formula contains natural wax to protect and fortify your lashes. 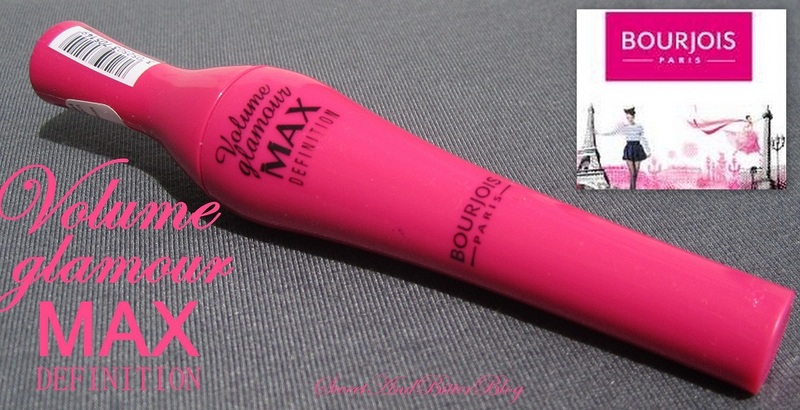 Packaging – As always Bourjois managed to give the prettiest package – a pink mascara. But the packaging is bigger, in fact fatter than CVE. Wand – I cannot count and tell if there are 500 bristles or not but there are those tiny ones on the end. 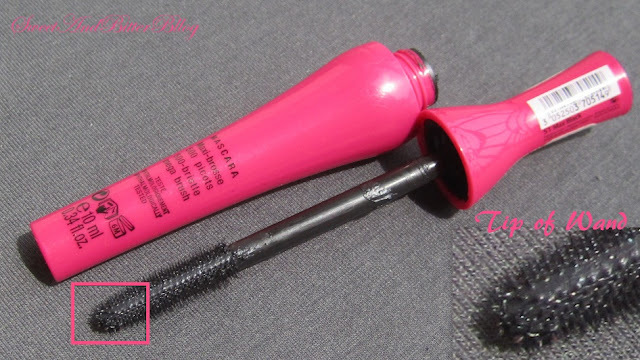 If you are a regular mascara owner then you know that when the bottles is full then you sort of get those tail of mascara on the tip as you pull it out (hope this is making sense…you will know if you use those creamy formula mascara). Now, this tail kinda hide those bristles and to actually use those tiny bristles which no doubt are awesome, you need to wipe out that tail leading to lots of product loss. I don’t mind that much as I will never finish it because no matter how pretty mascaras are, they won’t be used for more than 3-4 months if used frequently and 7-8 months otherwise. On My Lashes – For the first time, I ended up applying on my eyelids as well because its more thicker wand. Application was easier later on. I used a rotating motion…hope it start coming with a rotating wand..and it was better. There was very less curling effect by this alone but all in all I liked it. Observe how the tiny lashes are highlighted properly in the second pic compared to the first one. An appeal to my Darling Readers – If you are Indian then please apply mascara. It’s far better, natural and pops your eyes than black Kohl. Just try once as I am not forcing you. Start with a creamy formula and do test and found what kinda of want is suitable for you. Do not buy very costly ones unless you are in the mood to splurge. If you are non-Indian and apply mascara – Kisses to you! Have you used this mascara or any other Bourjois mascara? Do let me know if you know any other mascara with similar bristles. good review dear..i didnt use mascara like this...have to try.. Yes they do! which one did u used Riddhi? A guy said all that! Whoa! Thoroughly love all the Bourjois mascaras unfortunately with L'Oreal, Maybelline and Bourjois, they keep discounting the good ones and bringing crap ones into the market.